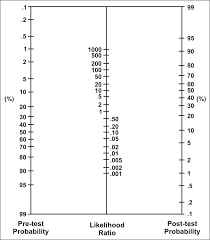 The Likelihood Ratio (LR) is the likelihood that a given test result would be expected in a patient with the target disorder compared to the likelihood that that same result would be expected in a patient without the target disorder. For example, you hav e a patient with anaemia and a serum ferritin of 60mmol/l and you find in an article that 90 per cent of patients with iron deficiency anaemia have serum ferritins in the same range as your patient (= sensitivity) and that 15 per cent of patients with oth er causes for anaemia have serum ferritins in the same range as your patient (1 – specificity). This means that your patient’s result would be six times as likely (90/15) to be seen in someone with, as opposed to someone without, iron deficiency anaemia, and this is called the LR for a positive test result. After the serum ferritin test is done and your patient is found to have a result of 60 mmol/l, the post-test probability of your patient having iron deficiency anaemia is therefore increased to 86 per cent, and this suggests that the serum ferritin is a worthwhile diagnostic test. A LR greater than 1 produces a post-test probability which is higher than the pre-test probability. An LR less than 1 produces a post-test probability which is lower than the pre-test probability. When the pre-test probability lies between 30 and 70 per cent, test results with a very high LR (say, above 10) rule in disease. An LR below 1 produces a post-test probability les than the pre-test probability. 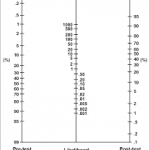 A very low LR (say, below 0.1) virtually rules out the chance that the patient has the disease. group d, who are disease negative and test negative.